Flat 9000 off.Flat 9000 off. Great buy for less money. I&apos;m really happy with this device. 5. Does support fast charging. 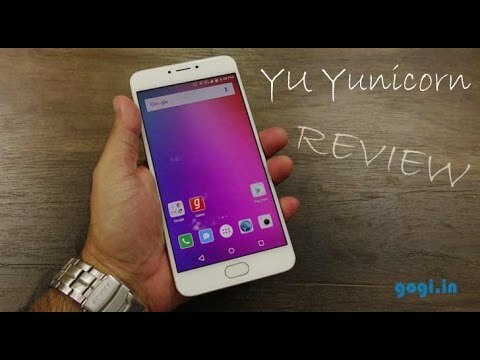 1 Pricebaba user have written their experience with Yu Yunicorn. If you own Yu Yunicorn, please do leave your feedback too. Lowest price of Yu Yunicorn price in India starts at Rs. 5,999 Yu Yunicorn is available on Flipkart at Rs. 5,999 and on Amazon at Rs. 6,199. Prices updated on 26th April 2019. Yu Yunicorn is the a mid range smartphone from Yu. The smartphone is in line with other Yu phones like the Yu Yunique and the Yu Yureka. The Yunicorn has a 5.5 inch display with a resolution of 1920x1080 pixels and has a pixel density of 401PPI. The Yunicorn is powered by a Helio P10 Octa Core processor clocked at 1.4GHz and has 4GB of RAM. The phone comes with YU OS which is stock Android with customizations by Yu. The phone has a metal unibody which gives it that premium feel. The Yunicorn has a 13 megapixel camera at the back with Autofocus and an LED Flash. On the front the Yunicorn has a 5 megapixel camera. The phone has 32GB of storage which is non expandable. The Yunicorn has a 4000mAh battery that is non user replaceable. The phone is a Dual SIM device and offers 4G LTE connectivity alogn with Bluetooth and WiFi support. Frequently Asked Questions (FAQs) about the YU Yunicorn. Ans: Yes, it has a hybrid slot for SIM slot. Ans: No, the Yunicorn comes with a non-removable battery. 6. Does it have heating issues? Ans: Yes, it does have some heating issues. Ans: It comes with Android 5.0.1 Lollipop and have received the Android Marshmallow update.